Married for nearly 38 years, author Deborah DeArmond and her husband have made the spoken declaration, I choose you today a regular part of their communication. It s when we least feel like saying it that we need to remind ourselves that love is a choice, not a feeling. 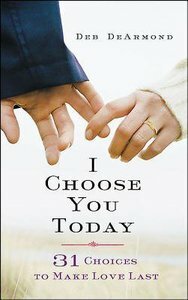 "I Choose You Today" features 31 scriptural principles that support marriage and help couples develop healthy biblically-based behavior. Built on an introductory anecdotal story, each chapter has an inspirational takeaway of not only what to do, but how to begin applying the principles immediately. Thought-provoking questions create talking points for couples to explore their own choices and experiences in each area and serve to generate open dialogue of discovery. "I Choose You Today" is not a book of "shoulds," but one of clearly identified choices that each individual can make to grow their marriage and align it with the word of God. Every saying ends with a conventional wisdom quote." About "I Choose You Today"
Deb DeArmond has owned her own leadership training and executive coaching practice for fifteen years. She is an expereinced speaker and writer with work appearing in "WHOA Magazine" and "Dallas Family Magazine" and a cofounder of mypurposenow.org--an online community for Christian women 50+. Deb and her husband, Ron, have three married sons and three grandchildren, and live in the Dallas/Fort Worth area. Find out more at debdearmond.com.